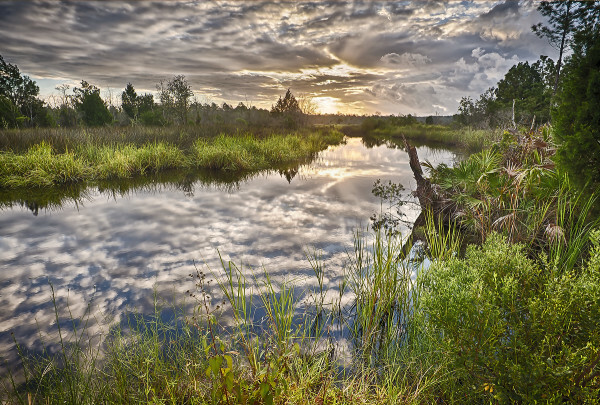 The Ocala National Forest to Osceola National Forest Ecological Greenway, or O2O, is a conservation project that aims to protect land between these two forests. The purpose of such efforts is to provide wildlife with a connected network of natural land to inhabit and to move through. Habitat loss harms many species, and human developments like roads and subdivisions are particularly damaging to natural cycles and animal movement patterns. The O2O corridor is an example of building “green infrastructure” on a large scale. Multiple agencies and interests are engaged in finding ways to connect two of the state’s largest conservation hubs over a distance of nearly 200 miles. Its completion will encompass an area large area, varied enough to support nearly the full spectrum of plants and animals of the southeastern coastal plain of North America, not to mention the protection it will afford several important watersheds. The O2O example inspired the thinking behind the 2012 Florida Wildlife Corridor Expedition, a media campaign to highlight the remaining ecological connections throughout the peninsula, from the Everglades to Georgia. The key component of the O2O is the landscape between Camp Blanding Joint Training Center and Osceola National Forest near the Georgia border. There are three large BOT projects designed to connect and restore habitat in north Florida’s timberlands. The southernmost of these proposed units is the Northeast Florida Timberlands and Watershed Reserve Florida Forever BOT. This project is unique in that in addition to its ecological value, by providing habitat around the military base, the project will act as a protective buffer, concealing military training exercises. The Northeast Florida Timberlands and Watershed Reserve consists of two separate units; one part of the project bounds Camp Blanding to the east, and includes already existing conservation land (Belmore State Forest). Completion of this unit would mean the protection of roughly 6,000 additional acres, but would connect Camp Blanding with Etoniah Creek State Forest, a distance of about 12 miles. The second unit describes a northeast-southwest diagonal along the west side of Duval County, stretching from the Nassau River north of Jacksonville to Trail Ridge in Clay County, near the town of Lawtey. This unit is roughly 120,000 acres, of which about 2/3 is still to be protected. Seventy-five percent of the land in the NFTWR is used or has recently been used for silviculture. Natural communities include mesic flatwoods, cypress and hardwood swamps, sandhill, xeric hammock, seepage slopes, and baygall. Rare species that occur within the project include gopher frog, gopher tortoise, eastern indigo snake, Hartwrightia, pondspice, and St. John’s black-eyed susan. The flagship species of the O2O project is undoubtedly the Florida black bear. Following research into the importance of corridors to the black bear of Osceola and Ocala by FFWCC biologist Jeremy Dixon, researchers were able to establish an optimal series of landscape linkages that animals were clearly using to travel in search of food and mates. These linkages helped define the O2O.